Sign up for free and just shop with Dreams as normal. Our average member earns over £300 cashback a year. Finance option is not eligible for cashback. Cashback is not currently available for members purchasing in Northern Ireland. Dreams cashback can be earned simply by clicking through to the merchant and shopping as normal. Dreams Cashback is available through TopCashback on genuine, tracked transactions completed immediately and wholly online. Shop for quality beds, mattresses and more and sleep easy knowing you have got yourself a great deal with our Dreams discount code and cashback offers. If you know what you are looking for, you will be able to find it quickly on their easy to use website, while if you are in need of some help choosing the perfect product for you, you can read their buying guides. Discover bed frames featuring contemporary or classic design, while you can browse new arrivals, bestsellers or sale and clearance items if you want to get your hands on a bargain. Not only do Dreams offer their 40 night comfort guarantee, but also a price promise and a recycling service should you need them to take away your old bed or mattress. Order online and you will also benefit from free delivery on furniture and free standard delivery to a room of your choice on orders over £100. You can browse the Dreams range by size, whether you are looking for a single, double or king size bed, or search by type if you are after something particular, such as a divan bed with drawers, a TV bed, wooden beds, bunk beds or an ottoman bed for great storage. Whatever you are looking for, you will find leading brands like Silentnight, Flaxby and Sealy. When it comes to mattresses, Dreams sell memory foam and pocket spring, amongst others, such as TheraPur ActiGel, to ensure you enjoy a comfortable night's sleep and receive the support you need while in bed. Their mattress finder or 'Comfort by Colour' feature will guide you through the process of buying your mattress if you are need of a little help. 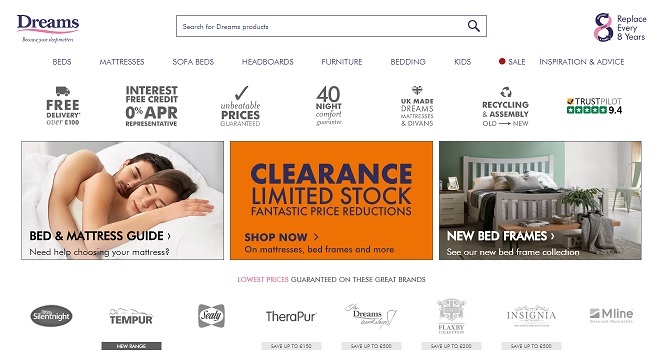 The Dreams beds collection also includes sofa beds and kids' beds, as well as natural wood or fabric headboards, bedding, including summer and winter duvets, and furniture such as wardrobes, chests of drawers and bedside tables - all of which you can save on if you sign up to TopCashback using the form at the bottom of this page. Dreams are committed to providing a great night's sleep and their 'Comfort Exchange' means you can ask for a mattress (exclusions apply) to be replaced if you find the original purchase to be the wrong comfort level for you. You must request this before 40 nights have elapsed from the delivery of the original item. If your original mattress is proving uncomfortable, you can change it for an alternative one of the same size. If you choose a mattress which is more expensive than the original, you will need to pay the difference, while Dreams cannot provide a refund if you select a lower priced item. The original mattress must be kept in good condition and they insist on the use of a mattress protector. 'Comfort Exchanges' are limited to one per product ordered, while re-delivery charges will be applied to the replacement product. Dreams are so confident they offer the lowest prices on beds that if you see the same one in another retailer's showroom for less (excluding 'online only' retailers and outlet stores), they will refund the difference plus give you an additional £10. Dreams will need to verify the cheaper price, while the price promise only applies to undelivered beds and bedroom furniture for 28 days after the day of purchase. They will not offer a price promise on clearance items. When your new bed or mattress is delivered, Dreams will take away your old one at the same time if you wish for recycling at their own specialised bed and mattress recycling centre. All materials which can be recycled will be reused and all other waste turned into green energy, while they will provide you with a green bag to seal your old mattress in. All you need to do to take advantage of this service is contact them 48 hours before delivery. Dreams deliver Monday-Saturday from 8am-6pm and have a dedicated fleet of vehicles to ensure a reliable and efficient service. You will receive a call before 10.30am on the day of delivery and will be given a two-hour time slot, while you can also track your order online. They will place your purchase in a room of your choice and assemble it if you require them to. Standard delivery to the room of your choice is free on orders over £100, Monday-Friday (a £10 charge applies on Saturdays), while furniture delivery is also free. The delivery of certain products is handled by selected partners, who will contact you to arrange delivery. If you change your mind about an online purchase, you will need to return the item in pristine condition and in the original packaging, where possible, within 14 days of the date of delivery. There will be a collection charge of £38. If you receive a damaged or faulty item, contact their customer service team and they will arrange a suitable day to pick it up from your home and take it away. Smaller items, such as pillows and bedding, can be returned to your local Dreams store. You can change the details of your order for free within 48 hours of placing it, while online orders can be cancelled up to 14 days after delivery. It’s our dream to give everyone a great night’s sleep. With 30 years’ experience and a genuine passion for sleep, we’re Britain's leading bed specialist. We’re totally committed to bringing you comfortable, brilliant-value beds and mattresses – and fantastic customer service too. What we care about most is making sure you get a great night’s sleep. So from the very latest in sleep technology, to the most stylish designs, our experts can offer you the biggest choice of beds in the country – many made right here in the UK, and all of them at the UK’s lowest prices. We’re Britain's leading bed specialist, and we’re here for you.